Can you stop the Sorcerer King before he becomes a god in Stardock’s new strategy fantasy game? 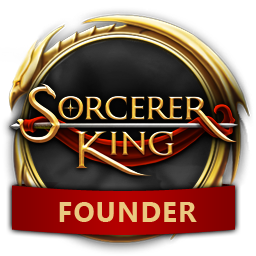 PLYMOUTH, MI — July 16, 2015 — Stardock today announced that Sorcerer King is available now and ready to challenge strategy gamers across the globe. In Sorcerer King players must build a kingdom and raise a force powerful enough to challenge the Sorcerer King who’s all but destroyed their world. Gamers are able to purchase Sorcerer King for $39.99 at www.sorcererking.com. You are the leader of the city state of Athica. Dark times have fallen on your realm as the powerful mage called the Sorcerer King has already conquered the land. You had established an uneasy peace with him until you learned of his plan to become a god by destroying the Elemental Shards that supply the world with its magic. He must be stopped. Players can challenge Sorcerer King and its ever ticking Doomsday Counter with the game’s six unique sovereigns that have their own skill trees, spellbooks and units. In Sorcerer King the landscape is filled with hundreds of quests. Completing them grants you crafting components, lore for researching new spells, new units, magical artifacts, and can even increase or decrease the Doomsday Counter. Along the way players will also encounter rivals that they may either choose to make into allies who will lend unique champions to support their cause or defeat them to steal their land and loot. Sorcerer King is available now from Stardock and on Steam, for more information visit: www.sorcererking.com. Stardock is a leading developer and publisher of PC games and desktop software. Its PC games include Sins of a Solar Empire and the critically acclaimed Galactic Civilizations series. Its desktop software includes Start8, Fences, WindowBlinds, ModernMix, and more. Visit www.stardock.com for more information.